As you walk toward the equator, Mintaka appears to rise higher in the sky. In this post we will learn how to use one bright star of Orion’s belt to visualize the Earth’s equator. When you look up at the winter sky in the northern hemisphere, Orion and his famous belt are impossible to miss. The belt is made up of three stars of equal brightness. One of these stars is called Mintaka and it is a guidepost for finding the Earth’s equator in space. Yes, the Earth’s equator projects out into space. That might seem strange to think of the Earth’s equator being in space. If you can imagine the Earth with rings like Saturn, projecting the equator into space would look something like that. Seen from the Northern Hemisphere, Mintaka is the rightmost star in Orion’s Belt. 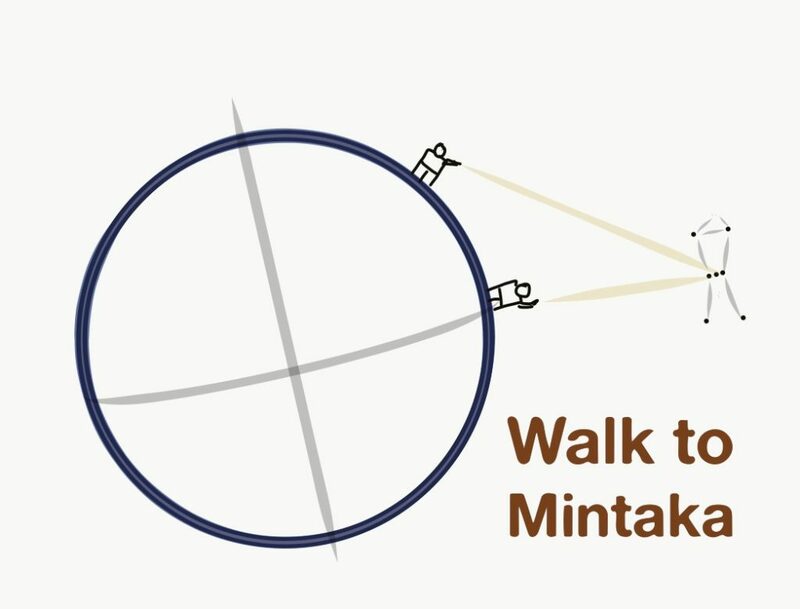 Mintaka is the perfect guidepost for us because Mintaka is located almost directly “on” the Celestial Equator – astronomers call this the “projection of the Earth’s equatorial plane into space.” In other words, if you are located at the equator, this star appears to rise from due east, be at the highest, overhead point in the sky at midnight – the zenith – and set due west. 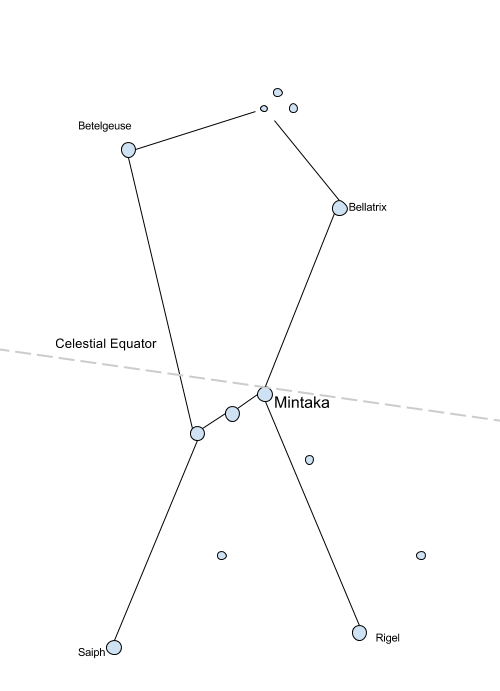 If you are not at the equator, and you are in the Northern Hemisphere, Mintaka appears in the southern part of the sky. The closer you are to the equator the higher Mintaka goes. Every step you take southward towards the equator makes Mintaka rise higher in the sky. This is because the Earth is shaped like a ball and we are walking on the surface. So, as we walk, our perception of what is directly “up,” changes. This applies to any star – stars like Mintaka at the celestial equator and stars like Polaris at the northern pole. As you walk “toward” the latitude where the star “sits,” the star rises higher and higher until it is overhead at the zenith. For instance, when you are at the North Pole, the North Star is directly overhead. As we move to different latitudes on the Earth we are “under” different stars. We walk to Mintaka to imagine the bright stars of Orion’s Belt climbing higher and higher in the sky. With every step we take toward the equator, Mintaka rises. Previous PostPrevious Quiz – When is the best time to see Venus?